BMW is set to introduce the new, 3rd generation 2014 X5 to the US market. There are many changes to the X5, and we will cover the most important, but what is really new is that this new X5 will basically drive itself now in certain situations. This is really the first mainstream vehicle that will do this and we will go over that in detail. BMW invented the sporty, full sized crossover market with the X5 in 1999. At that time the 3 Series sold about 77,000 units in the US market. It was the biggest seller in the line by far. That model has crept up in sales over the years to about 100,000 units. Had BMW stuck only with the smallish sport sedan market, it would likely have been out of business by now. Instead, in 1999 it changed the automotive landscape and introduced a US built X5 “light truck” which is what it is officially, and sales of the new vehicle were huge from the outset. In its first full year of US sales the X5 sold 26,000 units. In year two, 2001, sales leapt up to 40,000 units. Last year the X5 sold almost 45,000 units, and the smaller X3, sold 35,000 units. In terms of larger luxury vehicles these sales are enormous. Only the 3 Series cars and the 5 series cars outsell the X5 and X3. The X5 and X3 outsell Mini handily. To say that the X5 is important to BMW is a vast understatement. As we mentioned, the look is all X3. The sides have the flame-cut look, but in a good way. The front has a nose that is basically vertical, which we now see on everything from the Mazda 6 sedan to the Cadillac CTS BMW calls it an “upright nose.” The look is all X3, the little sibling is now a step ahead of the X5 in terms of design language. The “BMW-shaped grill” is there (they don’t have a kidney shape anymore, so let’s all stop saying that shall we?) and the cool split real tailgate returns. In fact the cool tailgate is cooler because it is power in every way. The little tailgate folds up and down with power and the top section with the glass also does. Neat. The interior now has a 10.2 inch display. Creeping ever closer to the Tesla size tablet they bolted to the dash. This is smart because Tesla’s next carbon credit-mobile will be a “Model X” which will compete with the top of the line X5, which BMW calls the X5 xDrive5.0i. That is certainly a lot of characters to say AWD, V8. The V8 carries over and the 3 liter twin turbo V6 does as well. There will be an X5 xDrive35d diesel. Ini one paragraph that is the synopsis of the new vehicle. Torque News will dive deep and tell you about all the door knob colors separately, but we want to get to the big news. 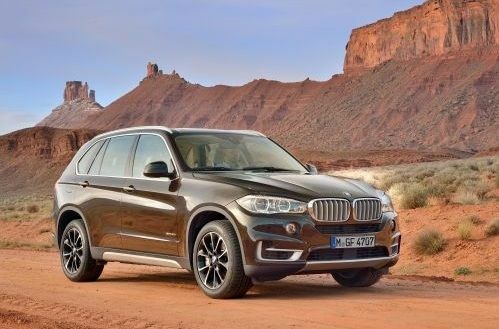 Your new X5 can be outfitted with options that will allow it to basically drive you to work. Assuming your drive to work is in traffic and stop and go type hassle-driving. We all knew this was coming. Before we get to the self-driving stuff we also need to let you know that while you drive your X5 you can opt to have it tell you when to ease off the accelerator. Called the Proactive Driving Assistant, it is part of the Eco Pro system the vehicle comes with. It gives you hugely helpful information about when to not be hammering the gas. BMW tells it this way “Proactive Driving Assistant function also tells the driver exactly when to ease off the accelerator when approaching corners or a speed-restricted section of road, in order to save fuel.” If you haven’t slammed the desk and clicked back to your other open window on the tablet we will go on. Yes, the X5 will maintain your lane (it will keep you perfectly in the middle actually) and it will speed up and slow down so you can do other things up to 25 mph. Imagine yourself in the daily crawl to work on a congested freeway or long access road. The X5 can take over and drive for you on that particular stretch. This feature is called Traffic Jam Assistant. Cadillac plans to release a similar system soon for highway driving. If everything gets ugly for some reason, the new Automatic Collision Notification doesn’t just dial for help, it will tell the first responders the chassis number of your X5 (that is weird), the color, and how many passengers and which seats they are in, and if their airbag was deployed. The system can also tell first responders the X5’s location to within a few feet. The new X5 breaks new ground in a field it created about 15 years ago. The 3rd generation X5 goes on sale late fall.